Another whisky review today, again coming in the form of a crazy exclusive, you’ll probably never get to try. A single cask sample from the Cadenheads warehouse. 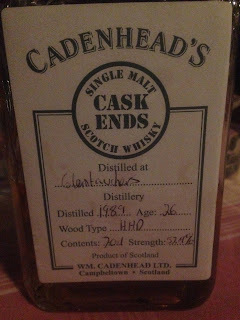 I think these ‘cask end’ bottlings are from when they’ve emptied the cask into bottles and there is an awkward amount left over that they leave for visitors. Could be completely off on that though, I don’t know everything it turns out. Nose: A lactic oak note hits first, green apple, really fresh fruit, a little tropical, mango, quite complex, quite delicious too, a little fresh leather and a tiny hint of ash. Taste: Soft and very tasty with plenty of red apple, oak, then slightly tropical mango building, some dry oak, some white florals, a little honey, quite a complex one while still managing to be very delicious. Finish: Long. Tropical mango, milk bottle sweets, oak and some green apple peel. 26yo HHD. This one is very good, but the lactic note holds it back a tad on the nose. These Glentauchers do seem to do well with some age to ‘em.